That summer trip to Kyrgyzstan is but a distant memory. The kids are back in school. The Houston temperatures are dipping into the merely tolerable range, and the swimming pool is no longer unpleasantly warm. That can only mean one thing. Fall is upon us. And with Fall, comes its evil twin sister, annual planning season. For many of our clients, the dreaded ritual of annual planning rolls around and starts to heat up precisely when the outside temperatures are cooling off. This year, with oil prices circling the drain, many of our regional clients are wrestling with the question of how to optimize the annual portfolio of projects, i.e. how to build the business case to support centralized prioritization vs. the traditional suboptimized prioritization by business unit – topics we’ve visited on this blog here and here. That got me to thinking, can we leverage some of the tools in our PMO toolbox to quantify the impact of changing how we perform annual planning? Each of these scenarios has its own strategic drivers that have been decided by the BU leadership. What we’ll do is to first go through an exercise where each Business Unit prioritizes its own projects within a preassigned budget. Then, we’ll throw all of the projects back in the hopper and prioritize everything against the same organizational priorities. Doing so, yields the following projects for BU A, with a budget of $10MM…. Hence, for a total of $30MM, allocated evenly across 3 business units, we estimate that we’ll plan for a total of 41 distinct projects. Now, let’s perform the same exercise, but across all of the business units, i.e. 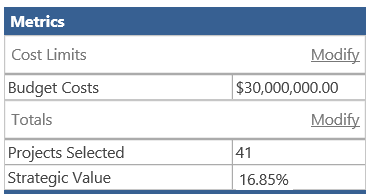 using a central pool of $30MM, where I am ignoring that projects are coming from different business units. Note that this calculates 37 projects for a total of 35% of the total potential strategic value. I’ll now run the same simulation, but force in the projects that each of the business units selected as part of their individual portfolios. See how I ended up with more projects (41), but my strategic value dropped to 16%? 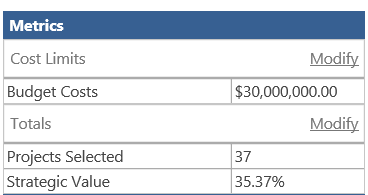 Basic conclusion, if I pick projects within each silo, and then aggregate the budget, I ended up losing 19% of the overall strategic value from the overall perspective of the organization. Again, I acknowledge that this is a bit of an artificial thought experience. I also acknowledge that there are totally valid reasons to keep budgeting separate by business unit. That being said, if you’re looking to make a business case for improving your annual planning processes – and at least attempting to include the perspective of the overall organization, then this may be a valid approach. Still interested in this topic? Go ahead and register for our upcoming Webinar on Making Annual Planning Fun Again – September 24, 2015 @ 11:30 PST.